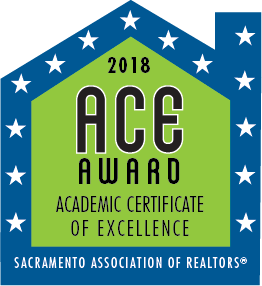 The purpose of the Sacramento Association of REALTORSˆledR; Academic Certificate of Excellence (ACE) Award is to recognize SAR Members who have met the approved education class criteria listed below. You must be a current SAR REALTORˆledR; of Affiliate member in good standing with the Association. To be in good standing means no financial obligation to the Assocation and a clean record with the California Bureau of Real Estate. Complete and submit ACE Award application documenting attendance to at least 12 SAR Classes or 24 class hours with a minimum of 6 classes attended. Applicants are required to attend the full duration of the class. Classes include those hosted by SAR Education Committee, Masters Club, SAR Commercial Division and any other SAR Committee or entity. Classes not included are those hosted by WCR, NAHREP, AREAA or any other organization whose attendees do not register through SAR even if the class is located at SAR. The SAR ACE Award recognizes SAR Members who are dedicated to perfecting their knowledge and skills by taking advantage of classes at SAR. Award winners are acknowledged for their commitment to go "above and beyond" in looking after their clients' needs through the continual pursuit of educational excellence. Driven to learn and grow, ACE Award recipients stand out from the crowd. We believe that education develops opportunities that yield success for the practitioner as well as the clients served. The SAR ACE Award recognizes those who make learning a priority on their way to achievement. Award winners will be mentioned in the February SAR eMagazine under "List of ACE Award Recipients"
The deadline for applying is Friday, January 4th, 2019 at 4:30pm. No applications will be accepted after this date.